Uber - and it's valuation - have been an avatar of the intangible economy. It has eschewed owning tangible assets - like the cars its drivers use - understanding that ownership and maintenance ties up too many valuable financial assets. 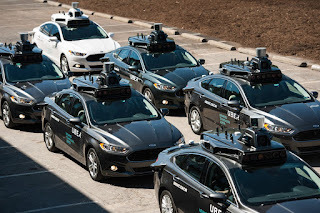 Many have hailed its strategic move into driverless vehicles as a clever means of eliminating those pesky human operators and all of their annoying demands for 'rights' like a living wage. The challenge is that the drivers who currently supply their own vehicles are not going to buy, own and operate driverless cars. Uber, or some company it creates or partners with - like Daimler - is going to have to do that. But if the auto manufacturers are doing the hard, complicated work of manufacturing, maintaining and supplying the hardware anyway, why not just develop their own driverless software? If Uber Technologies Inc. ever collapses, historians may trace its undoing not to its troubles with labor relations, intellectual property, regulatory conflicts or sexual-harassment allegations, but to technological disruption. This would be the same technological disruption the company itself pledged to use to upend the auto industry and the $2 trillion a year tied to it. Less than a year ago, Uber Chief Executive Travis Kalanick described self-driving cars as an “existential” threat to his company, saying that his team must get the technology to market before competitors do, or at least at around the same time. Self-driving vehicles would ultimately be much cheaper to operate than ones requiring human drivers—robots work tirelessly and don’t demand raises. The first companies to roll out fleets of automated taxis could quickly drive their human-powered competition into oblivion. Uber’s philosophy, both internally and in its pitch to consumers, is that it’s a hassle to own a car. The irony is, for the pay-by-the-ride future of transportation to be realized, someone has to own a lot of cars. Chances are, it won’t be Uber. When Mr. Kalanick declared the make-or-break importance of self-driving technology, the company had just acquired the startup Otto, which made Uber a contender in a space dominated by others. Less than a year later, things have changed dramatically. Uber is now embroiled in a court battle with Google-parent Alphabet Inc. over the source of Otto’s self-driving technology. Alphabet subsidiary Waymo presented evidence it says proves Uber’s former head of self-driving technology stole the technology from Waymo, where he previously worked. If Uber loses, its self-driving technology program could be shut down under trade-secret laws. Uber declined to comment on the suit. Attorneys haven’t disputed the allegation that the employee stole files, but they have denied that Uber knew of, possessed or used those files. As the two spar, Big Auto is dialing up the competition. Last week Cambridge, Mass.-based automotive software company NuTonomy Inc. announced a partnership with Peugeot , while Samsung Electronics Co. got together with Hyundai Motor Co. General Motors Co. is committed to rolling out self-driving vehicles as part of a ride-sharing service, says a company spokesman. And Ford Motor Co.’s Ford Smart Mobility subsidiary acquired ride-hailing service Chariot in an apparent attempt to learn how such services are run. Almost every other major auto maker has announced plans for self-driving cars or a partnership with one of the many technology companies working on self-driving technology. All of this is part of what auto makers and ride-hailing companies anticipate will be a larger transition to “transportation-as-a-service”—potentially the end of widespread vehicle ownership in developed countries. Subscribing to such a service for all of a person’s transportation needs within a typical American city could cost anywhere from 10% to 25% what an average consumer now spends on owning, maintaining and insuring a vehicle, says Tony Seba, co-founder of technology think tank RethinkX. Cost savings on that order could lead to rapid adoption akin to the touchscreen smartphone revolution, he argues. This disruption hinges on the arrival of dependable autonomous vehicles. And it’s not at all clear when they’ll get here. Tesla’s Elon Musk said last week that one of his vehicles will be ready in two years; Uber plans to have its autonomous vehicle available somewhere around 2021. Uber seems well positioned to take advantage of this disruption. Not only is it working on its own technology, but David Richter, vice president of strategic initiatives at Uber, says that auto makers will benefit from first putting their own self-driving vehicles into service in an existing network—yes, like Uber’s. Daimler AG , maker of Mercedes-Benz, is betting on Uber: It plans to manufacture self-driving cars for Uber’s network. GM has bet on Lyft Inc., and is building a complement to Uber called Maven Gig that uses human drivers. But even if Uber can keep up in terms of autonomous vehicle technology—or find more willing partners in the established auto industry—there’s a much larger problem looming ahead. The companies that will profit from the transportation-as-a-service revolution will depend on an incredibly costly infrastructure—one that doesn’t yet exist. Someone has to buy and maintain all the autonomous vehicles, enough to replace all of the cars driven (and usually owned) by Uber and Lyft drivers, not to mention many of the cars driven by you, me and countless others, too. To date, Uber’s model has been built on it not owning vehicles. Owning an enormous fleet of them, which might be required to make transportation-as-a-service work, is in some ways antithetical to the business model that has given Uber a nearly $70 billion valuation, more than any other startup. That model depends on outsourcing vehicle ownership and maintenance to its drivers. Uber does own its prototype self-driving vehicles, but declined to comment on the extent to which its future would depend on owning vehicles. Auto manufacturers have a great deal of experience working with the complex web of dealers, financing companies and fleet managers—even car-rental agencies—that could potentially be repurposed to manage millions of self-driving vehicles. Owing to all these factors, Uber, Lyft and their imitators will eventually cease to exist as stand-alone companies, either going out of business or being acquired by car makers, says Sam Abuelsamid, a senior analyst with Navigant research who specializes in mobility. “It’s a lot easier for an auto manufacturer to replicate what Uber or Lyft or Gett has done than it is for an Uber or Lyft to get into either manufacturing or even just buying vehicles and having to maintain them,” he adds. A spokesman for Lyft says that it will someday operate its own fleet of self-driving vehicles, but it’s not clear whether it will own them or its auto maker partners—for example GM—will. Fickle customers aren’t likely to be loyal to any particular transportation provider. Unlike the hassle of switching from an iPhone to Android, for example, there is no inconvenience to consumers to switch from one ride-hailing service to another. The future of transportation—cheaper, cleaner, less congested—could be great for consumers. It will also open up new sources of revenue for technology companies, the arms dealers of the autonomous-vehicle war. As for Uber, the company faces a difficult choice: Either figure out a way to buy or at least manage an enormous fleet (possibly by going public to foot the bill), or face annihilation by others who will.